How Did Occoneechee Mountain Form? The northwestern face of Occoneechee Mountain is home to an active mine and an abandoned quarry that contains a white rock with one of the softest minerals known in geology – pyrophyllite. Ironically, the western peak of Occoneechee Mountain is the highest point in Orange County. So, why does a mountain that is partly composed of one of the softest minerals form the highest peak in Orange County? The same geologic process that formed the soft mineral pyrophyllite also formed abundant quartz. Quartz is very resistant to erosion and forms the central spine of Occoneechee Mountain. The long answer to this question begins millions of years ago when the Hillsborough area was in the middle of an active volcanic center. Hot magma intruded the thick pile of volcanic ash and lava deposited during the active life of the area’s volcanoes. Rainwater and/or snow melt (known as meteoric water) percolated downward through the rocks (see animation above) to high-temperature regions surrounding hot magma (plutons). There, the water was heated, became less dense and rose back to the surface along fissures and cracks. When the heated water reached the surface of the Earth, hot springs, geysers and fumaroles likely formed. The downward percolation of meteoric water and subsequent heating and upward circulation of the water is collectively termed a hydrothermal system. As the heated water made its journey back to the surface of the Earth, some of the water circulated through the surrounding volcanic deposits. The heated water, called hydrothermal fluids, caused hydrothermal alteration of the surrounding rocks by adding, removing or redistributing molecules and elements in the parent volcanic rocks. The hydrothermal alteration in the Occoneechee Mountain area likely formed deposits of kaolinite clay, zones of the mineral sericite and pods of precipitated silica (SiO2) called siliceous sinter. Sericite is a very fine-grained white mica (muscovite) mineral. Kaolinte clay and sericite along with silica (quartz) and a host of other minerals are commonly found associated with modern hydrothermal deposits. With time, the magma that provided the heat source to the hydrothermal system cooled and solidified, thus shutting down the hydrothermal system. The kaolinite, sericite and silica deposits of Occoneechee Mountain were later buried by additional volcanic deposits. Millions of years passed, until the volcanic arc that carried the now extinct volcanic center of the Hillsborough area collided with another island or land mass. The collision caused the rocks to be folded and undergo low-grade metamorphism during the Virgilina deformation (Glover and Sinha, 1973). The heat and pressure of the low-grade metamorphism (and additional movement of silica-rich fluids), most likely changed the kaolinite deposits into the pyrophyllite-bearing rock. The sericite deposits were transformed into sericite phyllite. The siliceous sinter was recrystallized into massive pods of quartz rock. The pyrophylite, sericite, and quartz rock are often white or yellowish-white in color with red mottling (iron oxide staining) common. The resulting quartz rock is very hard and resistant to erosion. The central spine of Occoneechee Mountain is composed of a mixture of the quartz rock, sericite phyllite and lesser pyrophyllite. The quartz rock holds up Occoneechee Mountain. A generalized cross-section of Occoneechee Mountain showing the general distribution of minerals is provided in the following figure (Cross-section). Pyrophyllite is a hydrous aluminum silicate (Al2Si4O10(OH) 2) with a structure similar to talc. It is soft, like talc, with a hardness of 1 (can be scratched with fingernail). Pyrophyllite is relatively chemically inert, has a high dielectric strength (a material that has negligible electrical or thermal conductivity) and a high melting point. Pyrophyllite is used in the ceramic industry in the production of heat resistant products such as electrical insulators. It is used in soaps, paints and in bleaching powders. The most familiar use for the mineral is as talcum powder. The pyrophyllite from the Hillsborough mine is reportedly used in the manufacture of spark plugs. North Carolina is a leading producer of raw pyrophyllite in the United States. Want to learn more about the geology of the Eno River area? 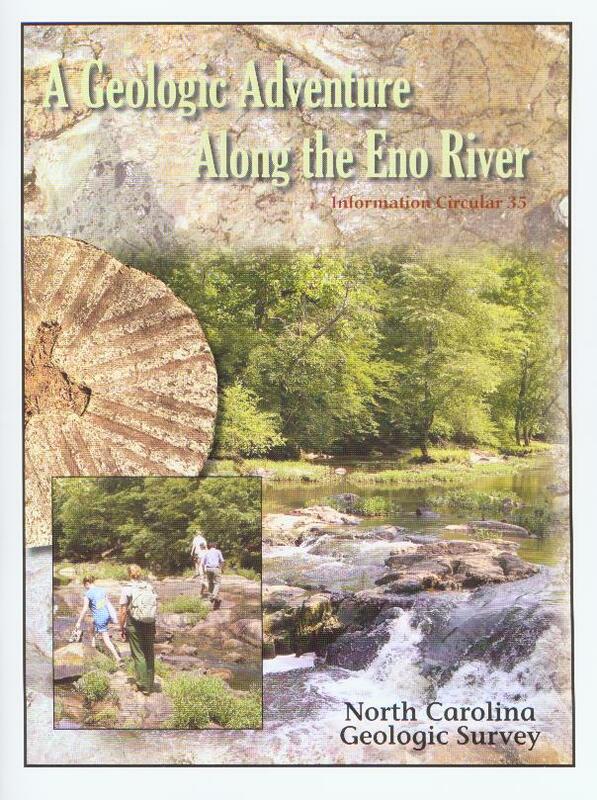 You may be interested in A Geologic Adventure Along the Eno River - A richly illustrated publication from the North Carolina Geological Survey.